Copy received from author for review/blog tour. The Seven Protectorates have enjoyed years of peace under Tav’s leadership, but a growing worry has surfaced. What about the land beyond Loden’s border? Where once there had been overtures of trade, now there is nothing. Tav decides to send a diplomatic expedition to re-establish contact, but who should go? Adventure runs in the blood of Tash’s children, especially in his head-strong daughter, Shara. Shara wants nothing more than to be part of the expedition to Nevaisser, but her father will never agree. He fears for her safety, but a rash decision on his part takes the choice out of his hands and sets up a chain of events that will have far reaching consequences. Nevaisser is a land teeming with conflict and at the heart of it is a mysterious stranger, hiding secrets that will test the alliance of the Seven Protectorates. A journey begun to protect Loden may result in tearing it apart. ML Hamilton has been teaching high school English and journalism in Central California for the last 20 years. Teaching students to appreciate literature has made her career rewarding; however, she always dreamed of publishing her own novel. That dream came true. Her first novel, Emerald, was published by Wild Wolf Publishing in 2010. The sequel to Emerald, The Heirs of Eldon, followed in 2011. 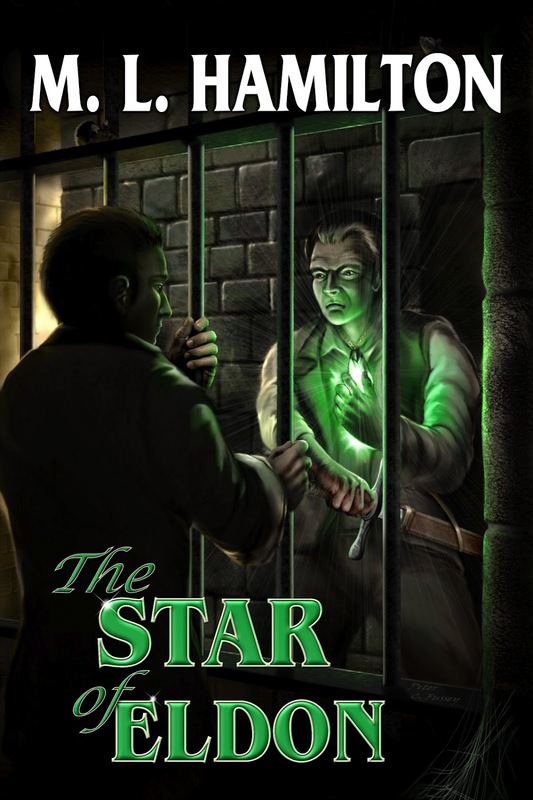 Now with the publication of the third novel in the series, The Star of Eldon, the world of Samar seems like home. In addition to teaching and writing, she has three sons, three dogs, and two cats. If she isn’t writing, you can find her at a band concert or a baseball game. What is the 'story behind the story' where did the idea come from, the setting, characters, etc. The Star of Eldon is the third book in the World of Samar series. The idea for the first book came from the rock band Styx and their Kilroy Was Here album. I played that album obsessively as a teen and the story just came to me while listening to it. The character of Kai, from Emerald, developed from my love of Shakespeare. After reading Hamlet, I became intrigued with the idea of a reluctant hero and wanted to create my own, but when it came to Talar, one of the main characters in Star, I feel like I perfected it. He is the epitome of a reluctant hero. There are only a few books about which I feel very strongly within just a few pages. This is one such book. Shara and her family quickly became people I cared about. Shara with a fiery spirit to match her auburn hair who longs for something she can't quite name but knows has to do with traveling to Nevaisser, despite her father's disapproval. Tav and Tash (Shara's father and uncle) quickly won my heart with their determination to care for those under their care. Tav, as Lord of Loden, carries heavy responsibility well. Tash struggles with letting his children guide their own lives because he so longs to protect them from harm. I also was fascinated with the world that Hamilton has created. For me, if the setting isn't believable, especially in a fantasy such as this, then the story doesn't feel real. The detail and care taken in creating this world drew me in immediately. The depth that the author has created and the realism of the difficulties inherent in keeping seven separate kingdoms united was apparent from the beginning. It felt real. I guess that's the best compliment that I can give. Plotwise, all I can say is whoa. The relationships between the characters ebbed and flowed just as real relationships do. The characters exhibit strengths and weaknesses that make them seem very real. I am eager to go back and read the first two books in the series, but this book stands on its own fairly well. It does refer to things that obviously happened in previous books but gives enough information that I didn't feel lost, just curious to know more. NOTE: There is a moderate amount of swearing (no 'f's) and one incident of premarital relations which makes this more appropriate for young adults (15 up). To find out more about the previous books, visit the blog tour page here. You need to be over 13 to enter. Winner will be notified by email and will have 48 hours to respond. Hey there! I’m a fellow blogger/writer looking to discover great blogs, and I’ve gladly added myself to your followers! I would also love ot invite you to check out a great Giveaway I’m having right now, that I think would be right up you alley!